A gentle and relaxing treatment for the ear! 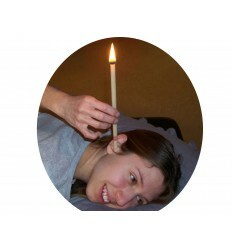 Ear Candles are a natural therapy for problems of ear wax blockage. Ear Candles are believed to have been first used by the Hopi Indians of North America and the practice has since spread across the world. Lighthouse Ear Candles are carefully hand made in Australia from unbleached cotton fabric infused with pure beeswax sourced from the Eucalyptus forests of Eastern Australia. A mix of drawing and calming herbs have been added to enhance the effect of the Ear Candles. There is also a unique safety filter inside the Ear Candle. Ear Candles – How They Work? Ear candling provides a relaxing and warming treatment for the ear. It is a non-invasive technique and generally more effective than the syringe system favoured by allopathic medicine. As the candles burn they create an up draught and this gently helps to draw out built up secretions and blockages. The warmth and herbs from the candles also assists in balancing the fluids and pressure in the ear. How to use Ear Candles? The candles are best used in a relaxing and healing environment. Ensure that the room is free from draughts and cross breezes. Ear Candles can be used in conjunction with other treatments. However Ear Candles should NOT be used with people who have had recent ear surgery, have perforated ear-drums, any cuts, cysts or tumours in the ear. • Lie the person sideways on a massage table or on the floor. • Place one finger over the stamped end of the candle (sealing the hole) and light the other end. Burn for 30 seconds. (This ensures the candle is drawing properly). • Gently position the lighted candle in the ear canal ensuring that it fits snugly and comfortably. • Have the person hold the candle in place gently taking care not to pinch the candle as this will impede the up draught. • Burn the candle until it reaches the line. This takes approximately 10 minutes. • The person will be able to hear a slight crackling sound and a pleasant ‘ocean type’ sound. From time to time the candle will flare as it burns off excess wax. • Once the candle has burned to the line remove it and extinguish the flame in a bowl of water or extinguisher holder. • Always treat both ears equally and do not leave the patient unattended. • The candles can be used for children 4 years or older. For children, use one candle for both ears, swapping sides after the candle has burnt down halfway. Use must be carefully supervised by an adult at all times. It is the responsibility of the user to familiarise him/herself with the medical theories and principles governing the use and application of Ear Candles. No medical claims as to the effect or outcome of treatment are made by the manufacturer or Helio.